Since its first (initially anonymous) publication in 1818, Mary Wollstonecraft Shelley’s Frankenstein has intrigued successive generations of readers and critics while inspiring dozens of cinematic adaptations and re-imaginings. In honor of the novel’s 200th anniversary the Carsey-Wolf Center at UC Santa Barbara presented Frankenstein: Afterlives, a series of screenings and interviews that explored the lasting impact of Shelley’s Gothic masterpiece on popular culture. The inaugural program in the series uses the 2017 biographical film Mary Shelley as a springboard for discussion about the author’s relationship to her most famous work, and the various interpretations of Frankenstein arising from scholarly examination of her life. 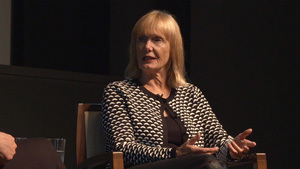 UC Santa Barbara’s Professor Julie Carlson frames Shelley’s story, both personal and fictional, as a series of oppositions – radicalism vs. conformity, class distinctions vs. egalitarianism, intellect vs. imagination, pragmatism vs. idealism, art vs. commerce – while noting that it is only fairly recently that scholars and commentators have begun to fully grasp the complexities of Shelley’s life and work. Frankenstein is key to any such discussion, not merely because of its iconic status but because it was one of the first popular texts to foreground the post-Enlightenment confluence of art and science. The story’s resulting conflict between pure scientific inquiry and philosophical concerns constitutes an early treatise on bioethics, a topic of increasing urgency today. Frankenstein has also been championed by modern scholars and critics as an early feminist text, but Carlson cautions that this interpretation is dependent upon a consensus definition of “feminism” and is therefore debatable. According to Carlson it may be argued with equal validity that the novel was autobiographically-inspired, an allegorical reaction to Shelley’s own upbringing as, in Carlson’s words, “an experiment of radical parents.” Shelley was doubtless keenly aware of the oppositions mentioned above and incorporated them into her work, but she doesn’t resolve them neatly for the reader; rather than a destination, her interest was in the exploration. The many other possible interpretations of Frankenstein – as cautionary fable, post-revolutionary tract, political allegory, critique of English Romanticism, etc. – are a tribute to the novel’s many facets and confirmation of its status as a vaunting work of imagination.